In a technical sense this first image is a poor photograph – it’s blurry and improperly exposed – but there is something about the way it expresses the season that I like. Partly it’s the colour of the leaves and the movement of the water but it’s more likely that I am recalling the moment when I was actually there and responding to the environment. We each bring our own rich history with us when look at things. It’s been a long while since I’ve posted images of the landscape from a broader view. 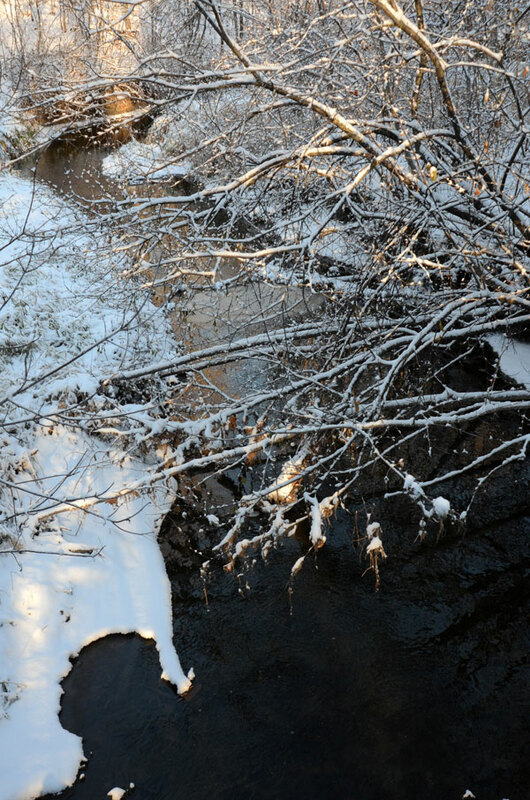 These are views of the winding creek, which I have photographed the slow-moving surface of, so many times. Photos are so evocative – your images and words remind us why, and how 🙂 I always enjoy your work Karen. well you know that blurry photos can be veeeery beautiful… hyperrealism sometimes is not the key! I think there are times when something blurry just says what you want it to – I’m glad you agree, thank you! Picasso once said that he paints things as he feels them, not as he sees them. It’s much harder to photograph things as we feel them, but we can–and do– frame, focus, edit and select them with a bias toward feeling. I like the shot, too. Thank you, Mark. Yes, I do try to photograph things as I feel them – and sometimes it works, I think. It’s working as intuitively as possible. Thanks for your great comment. Thank you, Elena – sometimes the technical aspect is secondary it seems. At first I thought it was an oil painting! Beautiful. That’s a great reaction, Jane. Thank you. The first is my favourite and reminds me of Breughel – there’s something deep, and earthy and very painterly about it, but these are all wonderful. I don’t know if I’m supposed to reply here. I am not Karen, but I see the feeling tone of a Breughel here, also.. Photography should always be from the heart.. If the visual details were the essential, it’s better to go there and see it by oneself. Still, I don’t think my self seeing the world in Macro-Elmer or Macro-sonner like sharp accuracy but rather blurry vague image. The photos here showed enough atmosphere and I don’t know whether the photo could be richer if it was sharper. So many things make a photo special! Nice to step back and see part of the creek, though it is no more the whole than are the reflections you capture on its surface. It raises the interesting question of how much of subject do you need in the frame to have captured it successfully, or at least the feeling of the place. I especially like the bottom one for the light in the reflection and trees on the bank. Thank you, Ephem. I love that early morning light! I do too! I just don’t much like early mornings which can be complicating. Winters are better for me that way. 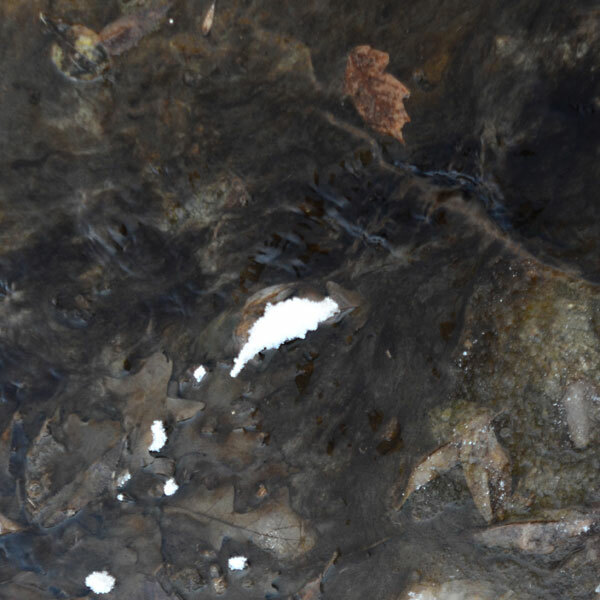 There is something about snow and a stream that I find incredibly moving…maybe it’s the aesthetic/visual appeal combined with my profound love of nature…all of it captured together…beautiful, Karen…. Thank you, Scott. I’m glad these resonate with you. Karen – I have been working back through your gorgeous December 2012 posts and thinking about what I have missed while I was away. When I look at your work, it always lifts me for three reasons. The first of these is just how stunningly wonderful and intricate the natural world around us really is! The second is that you have an eye that sees nature in a way that most people don’t see it, and without your posts, might never see it! The third reason is that you use your photographic and creative skills to present what you see in the world in such a beautiful way! Every time I look at your posts I find myself absolutely captivated and uplifted and I wish I had managed to keep following them when I was away and not coping very well with mum and all that went with that, even if I didn’t post myself! In hindsight, I think they might have helped quite a bit! Silly me!